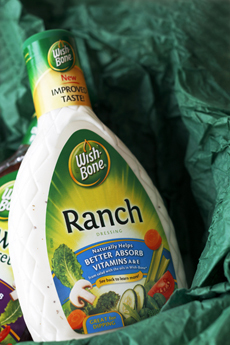 Wish-Bone Salad Dressing has just revamped its popular Ranch dressing and is giving it to three lucky winners. The prizes also include a travel salad container with an ice pack, to keep salad-on-the-go fresh and crisp. Loaded with the flavor of herbs, garlic and a hint of tangy buttermilk, Wish-Bone’s smooth and creamy Ranch dressing is great on salads, vegetables in dips and more. It’s also available in a fat-free version, is an excellent source of Omega-3s and is gluten free. Retail Value Of Prize: Approximately $14.00. To learn more about the new and improved dressing, visit Wish-Bone.com. To Enter This Gourmet Giveaway: Go to the box at the bottom of our Oils, Vinegars & Salad Dressings Page and click to enter your email address for the prize drawing. This contest closes on Monday, January 10th at noon, Eastern Time. Good luck! greens. Photo by Katharine Pollak | THE NIBBLE.